Tanner Industries, Inc. is pleased to announce that it is offering emergency response training programs designed to meet the requirements of OSHA 29 CFR 1910.120(q) for response and are customized for personnel responsible for managing, planning and responding to ammonia incidents. 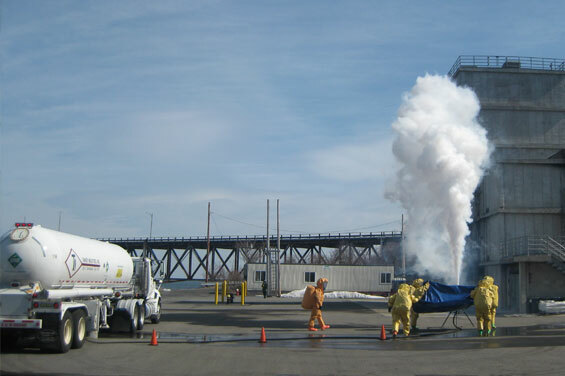 Classes are designed to meet the needs of both ammonia industry personnel, such as those dealing with ammonia refrigeration, power plant use, as well as other ammonia industrial and agricultural applications, and public sector & response personnel, such as fire department and hazmat team members. Classes are held at Tanner Industries, Inc., Southampton, PA and Philadelphia, PA. Classes conducted at your facility are also available. All classes include training program, course material and lunch. 4 hours classroom training with 4 hours tabletop practice exercises using 3 dimensional "mini-city"
Space is limited so please contact David Binder at 800-643-6226 or visit our website at www.tannerind.com for information and registration form.